Added a bathroom to main floor. Brent Dunlop and his employees and subcontractors did an incredible job. Brent was a complete professional from start to finish. His estimate was right on, and any extra costs were changes we made as the project progressed. The best thing about working with Brent was that everyone seemed to take pride in the work and wanted it to come out good! After the project was done, they cleaned up (even shampooed carpets on our porch) and it was like they were never there—except for the brand new bathroom. They were very good to my infant son and the whole thing was just really pleasant. My wife and I are new to the area and we were nervous about hiring a contractor where we really don't know anyone but this was just the best experience for us. It was well worth it! I had my basement and bath remodeled. Very well. I was very pleased with the finished product. Brent was prompt, very responsive to any questions and feedback that I had on project and I felt the project was completed in a very timely manner. In February we started a bathroom project and we could not be more thrilled with the result! 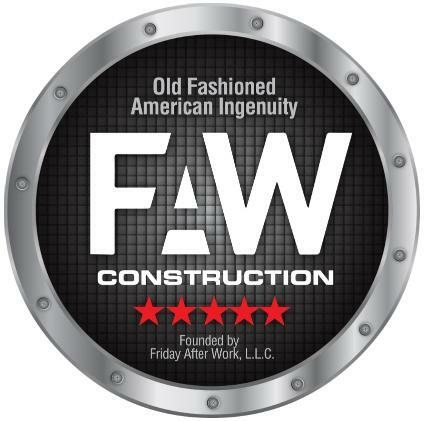 We were new to the area and didn't know what to expect but FAW Construction was ridiculously wonderful and professional. They worked hard, they cleaned up after themselves (they even shampooed the rug on our porch when they were done!!!) and they were so sweet to our young son. The owner of the company, Brent, was really chill to work with but also extremely dedicated to the project. Plus, at the end of the day, quality of the work was impeccable. If you have ANY construction needs I encourage you to seek them out. We will 100% be using them again for further projects. I got a new roof and new new walls from water damage and they couldn’t have been better to work with. Very professional and they did an outstanding job on both projects. I recommend them highly for any job you need done.